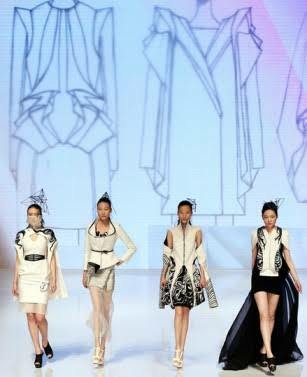 Want to know how to become a successful fashion designer? Have you spent your formative years watching "Project Runway," reading Vogue magazine and visiting fashion blogs, you're likely harboring a desire to follow in the footsteps of fashion icons like Gucci. But do you actually have what it takes to make it in the field? Many girls and young women dream of becoming fashion designers, but it doesn't mean they're cut out for the profession. Do you like to draw? If so, that's good news because you're going to need this skill as you pursue being a fashion designer. Strong drawing skills are a must in fashion, as designers need to be able to take a concept and get it down on paper. If you're lacking in this area, you can take classes to practice drawing ball gowns, dresses, pants or whichever garments you envision yourself designing. For example, how do you envision the pleats falling on a skirt or a blouse cinching at the waist? What about ruching, ruffles or embroidery? It is often the detail that makes a product unique, so this skill cannot be overlooked, even if you're great at visualizing and drawing. For example, you'll need to know whether a garment would work best in silk chiffon or another material. You'll also need to know which combinations of colors will be most flattering on a piece of clothing. It is these differences that make a design stand out. Prior to the drawing phase, a good designer must have strong visualization skills. This enables her to translate ideas onto paper, so that her colleagues have a sense of the look she's aiming for as they work toward a finished product. A thorough understanding of the business world, including finance, sales, and marketing, is essential to becoming successful in the world of fashion. Creativity is the essence of fashion, but without a good understanding of business, it is difficult to sustain a fashion brand and make it profitable. Many talented fashion designers have ended up bankrupt because they had a poor understanding of fashion's financial side. To create innovative designs, a competitive spirit is necessary. You don’t want to lag behind the competition or follow their lead. You want to be a trendsetter, and having a thorough understanding of the economy and the fashion industry will keep your ideas fresh. A strong sense of collaboration and camaraderie between departments at a fashion house allows creativity to flourish and contributes to its overall success. You'll need to know whether everyone is wearing skinny jeans, boyfriend jeans or something else entirely. Knowing what's on trend will let you know what the public is buying and what designers are creating.